It’s just after dawn when Naravisaya “Al” Les flips on the lights at his restaurant. There’s a rhythm to his routine— the same one he watched his father play out 15 years ago. First, he kicks off his rain-soaked shoes on the front mat and walks across to the cash register. Next, he presses his palms down on the laminate counter and sighs deeply as he looks out at the cool grey Seattle morning before starting to count his cash. Traditionally, residents of Richmond, California have had little voice in planning their city; the process being dominated by Chevron, real estate developers, and other corporations. But in the past six years, a community-based coalition—Richmond Equitable Development Initiative (REDI)—working with a constellation of community organizations and regional experts has successfully incorporated a solid set of community priorities into the new General Plan approved by the City Council in April 2012. Read more about Who Plans Our Cities? In spite of rising gas prices, worsening traffic, and growing public concern about climate change, voters in two of the largest and most diverse counties in the state rejected transportation tax measures (Measures J and B1) that promised to meet these important transportation needs. Yet, these same voters, only four years earlier, in the case of Los Angeles County, and 12 years before, in the case of Alameda County, approved similar measures (Measures R and B) with strong support. What has changed in that time and what does this mean for transit-dependent communities and their transportation justice allies? 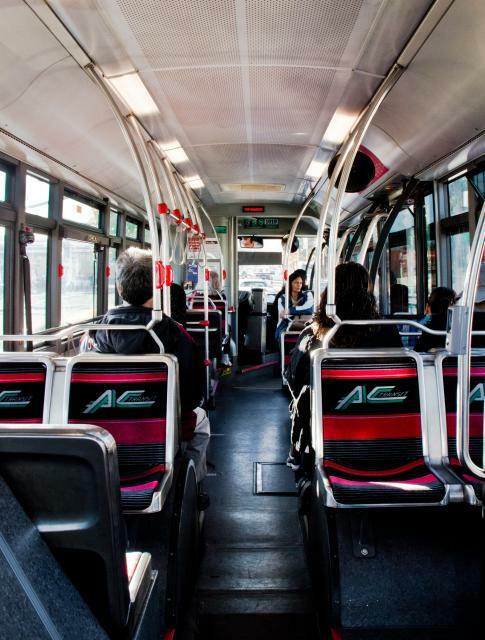 Alameda County’s Measure B1, promoted by Urban Habitat and many of its allies, included many important benefits for low-income bus riders. These were critical funds to improve bus service and restore cuts in service, provide seed money for a county-wide free student bus pass program, make major investments in bicycle lane and sidewalk safety, as well as provide more money for paratransit for seniors and people with disabilities. For this reason, B1 didn’t face the same grassroots opposition that Measure J did. 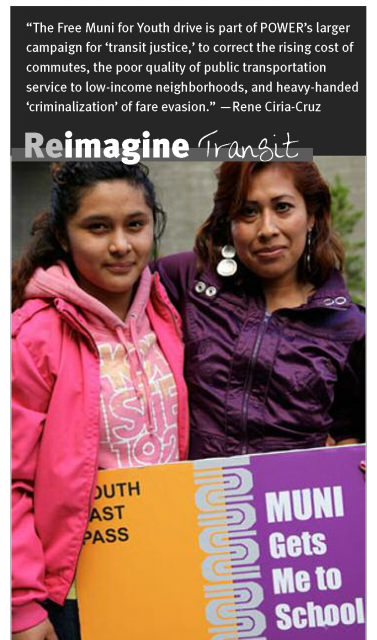 Low-income youth of San Francisco will be able to ride Muni for free during a 16-month trial period starting early in 2013, thanks to the efforts of a broad community coalition. After a two-year campaign, the city’s Municipal Transportation Agency (SFMTA) gave final approval for the funding on December 4, 2012. Campaign organizers want the program to begin in February, with a massive drive to sign up youth for free passes fully underway by March. In November 2011, the coalition won crucial support when the San Francisco Board of Supervisors lent its support to the campaign. 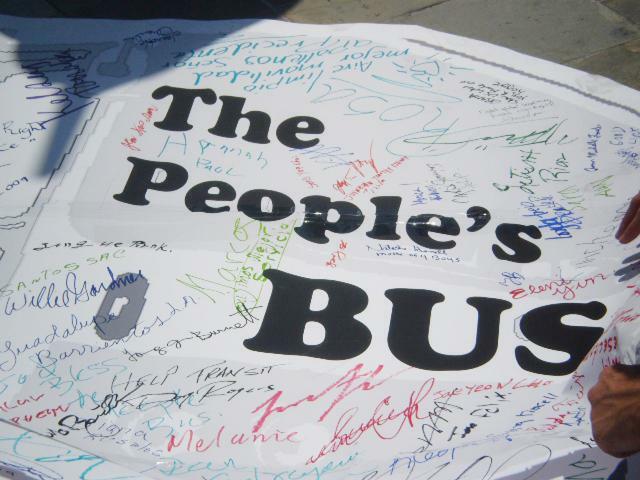 Spirited actions by youth, parents, and community advocates through 2011 had been aimed at winning relief for students and their families from the rising cost of bus and light rail fares following school district cuts to funding for yellow school buses.